Trombonists who practice orchestral excerpts are often guilty of plugging away at the printed notes with no real understanding of the piece as a whole. While there is no substitute for hearing live performances of the works to be studied, or at least owning multiple quality recordings, technology has enabled us to find new solutions. Case in point, the website TromboneExcerpts.org. Given the thorough integration of this book with that website, it is impossible to intelligently discuss one without mentioning the other. Through what must have been countless hours of preparation, Seth Vatt provides a wealth of free recording excerpts that ‘cue up the needle’ to the exact passages in which the trombone plays a prominent role. I wonder if younger music students can begin to conceive of the amount of time his labors have saved them. Therein lies both the blessing and the curse. That which is easily obtained may be undervalued. Also, some have raised the concern that this website will hinder sales of recorded music. That may be true but, in 2016, we have to wonder if the future of recorded music lies in subscription-based streaming services, not individually-purchased items. Vatt does advocate for the purchase of recordings. 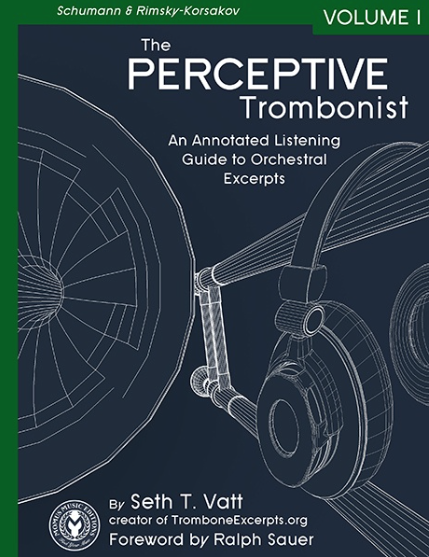 In his discography, which lists complete recording information, he states, “Serious musicians are encouraged to expand their collections and own these critical examples of fine trombone playing.” On the balance, I believe that Seth Vatt has done a giant favor for the trombone community by providing us with an extremely useful tool for the study of orchestral excerpts. The coil-bound book is clear and well laid-out. If students take the time to use this book methodically, they cannot help but become well-informed musicians as opposed to simple-minded “excerpt jocks.” I do not know how many volumes are planned for this project but, at this level of detail, it appears Seth Vatt has set out for himself a lifetime of work that, if completed, will not likely be rivaled in the pedagogy of trombone orchestral excerpts.